John Phillip's i860 diagram showing the changes in fossil diversity since Cambrian times which he used to justify his recognition of three great eras in the history of life. The duration of each era was based on measures of the total thickness of strata within each era. Friedrich Heinrich Emanuel Kayser, 1845-1927, German invertebrate palaeontologist who made a particular study of Devonian strata and their fossils from the Rhineland, Devon and Boulonnais and wrote a widely used textbook Allgemeine Geologie, 1893.
a major feature of vegetation on land. 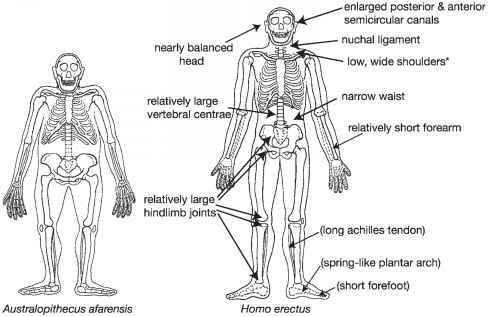 The possibility of human-related fossil remains being found within rock strata was still not a serious consideration. Although fossil bones and stone tools had already been found, they were either ignored or construed as historical remains. And, as we have seen, the near-surface and relatively young Diluvium was beginning to be accepted as the product of deposition by ice rather than a Noachian-type flood. Phillips was to return again to his overview of the division of Earth Time and the eras of life. The formal publication of Murchison and Sedgwick's German work in 1842 claimed that there are Devonian and Silurian strata in the Rhineland and Devonian in the Fichtel region, but no Silurian, and that Carboniferous strata overlay the Devonian in both regions. Overall they were correct, but in retrospect it was realised that they missed the Silurian rocks of Fichtel. By the 1850s the German Devonian strata had been further investigated by the likes of Ferdinand Roemer and the von Sandberg brothers, Guido and Fridolin, and shown to be rich in fossils, which were to provide a significant basis for further detailed subdivision of the system. And by the 1870s, Emmanuel Kayser's investigations of the oldest Devonian strata and their fossils in the Harz Mountains were showing links with the youngest etages (F, G and H) of Barrande's Silurian succession in Bohemia and raising questions about their true age that took the best part of 100 years to resolve (see below). Joachim Barrande, 1799-1883, French engineer and paleontological student of Cuvier's who settled in Prague and spent his fortune publishing a monumental monograph series describing and illustrating the 'Silurian' fossils of the Bohemia. The long debate became known as the 'Hercynian question'. The Harz fossils had been accurately described by German palaeontologists such as von Beyrich and seen to characterise a Hercynian stage of development. Kayser was sufficiently convinced of the Devonian age of this fauna that he also suggested that Barrande's Bohemian etages F, G and H be removed from the upper part of the Silurian and placed in the lower Devonian. The strata are for the most part limestones and the fossils marine shellfish with trilobites, but interbedded with the limestone strata are dark grey-black shales containing graptolite fossils. As we shall see, graptolites became very useful indicators of the relative age of lower Palaeozoic strata, especially for the Silurian and for the subsequent separation of the Ordovician System between Silurian and Cambrian strata. It was two British palaeontologists who made a major contribution to the study of the distribution of graptolite species through successive strata. In Britain the highest and therefore youngest graptolites are found in Murchison's Ludlow strata, but even here they disappear before the top of the series of Ludlow strata and its boundary with the base of the Old Red Sandstones. Consequently, the assumption was that this was when the graptolites became extinct - near the end of Silurian times. Barrande's Bohemian strata contain a number of shale horizons that are also rich in graptolite fossils and the assumption was that their disappearance from the Bohemian strata must be coincident with their disappearance in the British succession; that is, before the end of the Silurian. When the graptolites were studied in more detail in the 1950s, it became clear that there were differences between the last surviving species in Britain and those found in Bohemia and the Harz Mountains. The curious thing was that, if anything, the latter seemed initially to be more like some older British Silurian species rather than the last survivors. However, the other shell fossils found in the accompanying limestones did appear to be more like the latest British Silurian ones. Eventually, European graptolite specialists found some really well-preserved 'late' Silurian graptolites, and it became clear that they were indeed different from the British ones. The whole study of graptolites as organisms had become more sophisticated and it was realised that as with many marine organisms, it is possible to get endemic or provincial species whose distribution was restricted to particular seas and perhaps levels within the water column. British geologists also had to admit that the environments of deposition in the latest Silurian strata were strongly affected by an overall shallowing of the seas, especially in the Welsh Borderlands, and possible restrictions in their connections to the open oceans of the time. Consequently, it was likely that graptolites could have died out earlier in the progressively shallowing British region than in Bohemia and the Harz, where more open and deeper-water marine conditions lasted for longer. The question then arose as to exactly where the Silurian/Devonian boundary should be drawn. There was an ongoing international debate about the nature of such major boundaries, with a recognition that it was necessary to have some international agreement about them so that everyone was at least talking about the same thing when trying to correlate between strata and fossils in different parts of the world. Even trying to match strata within a small geographical area such as the British Isles could be notoriously difficult: witness the problems over matching the Old Red Sandstone and marine Devonian strata of the southwest of England. Part of the problem was that many of the major boundaries between successive systems of strata were first discerned where there were major changes from one system to another between the types of deposits and their fossils. For instance, the division between the Silurian, with its marine fossils found in limestones, sandstones and shales, and the Old Red Sandstone, with its reddish deposits and peculiar fish, had seemed pretty clear cut. Equally, there was an obvious division between the Old Red Sandstone and the Carboniferous above it with marine fossils in limestones and shales. It was realised that often such changes are more a reflection of gaps in the sedimentary record and phases of erosion rather than rapid prehistoric changes. Indeed, it is now realised, thanks to very detailed correlation by fossils, that Old Red Sandstone environments and sediments began and ended at different times in different places. Such boundaries often cut across time planes technically known as diachronous (meaning 'across time'). Equally, breaks in deposition might provide good, sharp boundaries, but they are no use as a record of the passage of Earth Time because often there is no way of telling how much 'time' is missing. The ideal boundary is one across which there has been continuous deposition of sediment with a fossil content that can be used for correlation as widely as possible. Most sequences of this kind are marine continental shelf deposits. The problem is that generally such depositional sequences show little or no significant change in sediment type and, if there is a change, it is probably recording a break in deposition. Important boundaries not only have to be in continuous sequences of strata but the strata also have to be fossiliferous. Ideally, the fossils also have to be those of abundant and widely spread organisms that evolved rapidly, are well preserved and easily recognisable. In lower Palaeozoic strata evolving lineages of trilobites and graptolites have commonly been used in the past, but various groups of microfossils are increasingly used because they are often more abundant. The requirements are not all easily fulfilled. Consequently, to mark an important boundary in a continuous sequence of strata, it is necessary to have a good understanding of the successions of fossil assemblages and lineages of related fossils that evolve through the interval. An agreed choice has to be made about some point in the fossil record of a well-exposed sequence of strata that can be most usefully recognised as widely as possible with commonly preserved fossil species. In addition, the chosen sequence of strata should be reasonably accessible to geologists, which is a tall order. Murchison's international network of contacts allowed him to 'recruit' a number of influential geologists, such as Verneuil, von Buch, von Keyserling and Barrande, into accepting the existence of the Silurian System within the Transition rocks of their own countries. As we have seen, Keyserling and Verneuil collaborated with Murchison in his expeditions across eastern Europe to the Urals, which culminated in the 1845 publication of The Geology of Russia in Europe and the Ural Mountains. In this book, Murchison not only established the Permian System but proved the extension of the Devonian System beyond Britain, and identified and mapped what he regarded as Silurian strata lying directly above 'Azoic' or Precambrian metamorphic rocks, thus excluding any recognition of the Cambrian. The critical acclaim of this work beyond the confines of the geological world resulted in a knighthood for Murchison and seemed to put an official seal of approval on his expanded Silurian 'empire', to the exclusion of Sedgwick's Cambrian. But as Conybeare pointed out at the time, such a downward extension of the Silurian defeated the original purpose of Murchison and Sedgwick's venture, in that Murchison had effectively replaced the name Transition with Silurian, although the subdivision within it had been improved on considerably. Among the most important and influential of Murchison's supporters abroad, from the palaeontological point of view, was Joachim Barrande, a French engineer by training, who lived in Prague and devoted his energies to describing and illustrating the abundant fossils of the Transition rocks of Bohemia. Barrande had been tutor to the French royal family and had followed them into exile in 1820, first to England, then Scotland and then to Bohemia. In 1831 he became personal tutor to Prince Henry of Chambord, but Barrande decided to stay in Prague when the royal caravanserai moved on. From 1846 until 1883, Barrande published over 29 volumes entitled Systeme Silurien du centre de la Boheme, which describe and illustrate the wonderfully rich fossil biotas. He spared no expense, paying collectors to bring him fossils from the well-exposed limestones, shales and sandstone strata of the Prague Basin and beautiful surrounding countryside of Bohemia, which was riddled with small quarries. Altogether, Barrande described several thousand species, many of them new, and paid for innumerable high-quality engravings from which the high-quality plates (1160 in all) of his books were printed. He spent his whole private fortune on the enterprise and it remains one of the great nineteenth-century contributions to our understanding of the fossil remains of early Palaeozoic times. His fossils are still preserved in the National Museum of Prague, despite the invasion of the city by Hitler's forces in 1939 and the Soviets in 1968. The preservational quality of these fossils was unsurpassed at the time and Barrande's monographs had a considerable international impact, helping further the establishment of the Silurian System in Europe and beyond. Barrande vehemently defended his espousal of the enlarged version of Murchison's Silurian System right up to his death in 1883. Ironically, it was because Barrande was so good at illustrating his fossils and his publications were so widely distributed in both French- and German-language editions that they were widely used for the identification and comparison of fossils from strata of similar age throughout Europe and beyond. This eventually threw up a number of discrepancies, not only concerning the question of the Cambrian but also the boundary between the Silurian and the overlying Devonian (see below). In the pre-Darwinian world of the 1830s, the investigation of fossil remains was still to a considerable extent at the 'natural history' stage of discovery. Murchison and his palaeontological collaborators were part of a general international effort to describe all aspects of the natural world, including the history of life on Earth. Of increasing concern was the question of whether life had progressed from primitive to more advanced forms, or whether all forms of life had been present right from the original 'creation' - the gradualist view versus the uniformitarian argument of Lyell. The investigation of the British Silurian played a significant role in undermining Lyell's concept, which had initially been supported by most British geologists, including Murchison and Sedgwick. Inevitably, it was tied into the question of how and when life had originated. And the resolution to this lay in the fossil evidence contained within what were at the time thought to be the oldest sedimentary strata within the Transition Series. As we have seen, from the 1840s the development of the conflict between Sedgwick and Murchison over the definition of the boundary between the Cambrian and Silurian resulted in Murchison extending the base of the Silurian downwards. This allowed him to claim that the very origin of life, as represented by the oldest organic remains, was to be found within an enlarged Silurian. But if this were true, it had a very far-reaching implication for Sedgwick's Cambrian, because it excluded the possibility that Sedgwick would be able to define the Cambrian on the basis of its contained fossils. By Murchison's definition, any fossils that were found were Silurian and therefore the rocks that contained them were also Silurian. Murchison seemed to be supported by evidence from Bohemia, where Barrande established a sequence of etages (stages A to G) within the Silurian. The first two were unfossiliferous but from C upwards each was characterised by its own profuse fossil fauna. Etage C contained what Barrande called the 'First' or 'Primordial Fauna', below which were the even older unfossiliferous rocks. Barrande visited Britain in 1851 and had found a distinctive trilobite from his 'Primordial Fauna' among the fossil collections of the British Geological Survey. And the Survey palaeontologist J. W. Salter went on to find several Etage C trilobite genera in North Wales in 1854. John William Salter, 1820-69, taxonomist, engraver, curator and palaeontologist apprenticed to J. de C. Sowerby (from 1835), assisted Sedgwick (1842-6) and Forbes (from 1846) before working for the Geological Survey of Great Britain (1854-63). Sedgwick had renewed his investigations of the Cambrian strata of North Wales in 1842, aided by Salter, and eventually, a decade later, mounted a vigorous defence of the Cambrian System, this time bolstered by fossil evidence for its independent existence and validity. He maintained that Murchison's inclusion of the Llandeilo strata in the Silurian was erronous and that their fossils showed them to be contemporaneous with the Bala Beds of the Upper Cambrian. Furthermore, the 10,000 ft of Lower Cambrian strata below this could be subdivided into two major divisions, which Sedgwick called the Festiniog and Bangor Groups, and these in turn contained identifiable sequences of distinct sedimentary rocks such as the Arenig flags and shales, the Tremadoc slates, Lingula Flags, Harlech Grits and Llanberis Slates, some of which contained fossils. Between 1851 and 1855 Sedgwick also published successive parts of an extensive review of all British Palaeozoic strata and their fossils. Needless to say, he took the opportunity to again defend the Cambrian and tried to turn the tables on Murchison by restricting the Silurian to the Ludlow and Wenlock strata and claimed that all strata from the Caradoc downwards were Cambrian in age. But it was all too late, at least during the lifetime of the one-time friends, who became increasingly estranged. Murchison's publicity campaign had won the hearts and minds of most of the geological community. Murchison even managed to claim that vast areas of the Scottish Highlands were Silurian in age. In the far northwest of Scotland there is a band of limestone called the Durness Limestone or 'pipe-rock', in which vertical fossil worm burrows are to be found. And there are places where schistose metamorphic rocks seem to lie above the limestone and then above these lie Old Red Sandstone strata, with their characteristic fossil fish. Although there are no fossils in the schists, Murchison argued that they had been metamorphosed in place and therefore were Silurian in age. The Geological Survey accepted the argument and so for much of the 1860s and 1870s the Highlands of Scotland were coloured Silurian 'blue' on official survey maps. Murchison's Silurian empire had reached its apogee, but nevertheless was going to be severely cut down to size. Sedgwick took every opportunity to try to reverse the situation, to such an extent that the Council of the Geological Society in London took the extraordinary step of passing a resolution banning any further communication on the division and classification of early Palaeozoic strata by Sedgwick. It was only years later, when Murchison's wife Charlotte died, that Sedgwick tried to mend the rift and wrote a heartfelt letter to Murchison commiserating with him over his loss. Murchison's claim that the origin of life itself was recorded within 'his' Silurian System was widely accepted. It was portrayed in one of the very first attempts to chronicle the history of life pictorially, published in an English broadsheet entitled 'The Antediluvian World'. By 1858, this view was even more widely distributed by its depiction in the second edition of a popular book on the Primitive World in Its Different Periods of Formation by the Austrian botanist Franz Xaver Unger. However, by the 1860s it had become clear to many geologists that there was a distinct Cambrian fauna to be found below the Silurian and that therefore life had originated much earlier than Murchison claimed. 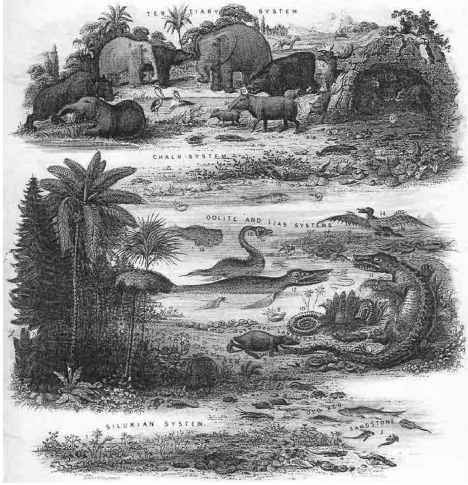 One of the first illustrated histories of Earth Time and its fossil inhabitants (entitled 'The Antediluvian World' and omitting the Cambrian) was engraved by John Emslie in 1849. Franz Xaver Unger, 1800-70, Austrian professor of botany at Graz, who published a Flora of the Former World (1841-7), a succession of reconstructed scenes beautifully illustrated by a well-known landscape painter, Josef Kuwasseg (1799-1859), followed by a similarly illustrated atlas, The Primitive World in its Different Periods of Formation (1851). During the late 1840s and 1850s, fossils from Barrande's Primordial fauna had been found in Scandinavia and North America and their distinctiveness from the Silurian fauna gradually became more apparent. Furthermore, there was emerging evidence of primitive life, such as the trace fossil Oldhamia from Ireland, having existed in the older rocks. Murchison eventually conceded in the second edition of Siluria (1859) that such ill-defined fossils might be Cambrian in age, but still adhered to a Silurian age for well-defined and stratigraphically useful shelly invertebrates, such as trilobites and brachiopods. The problems of definition of the Cambro-Silurian boundary took a long time to resolve. 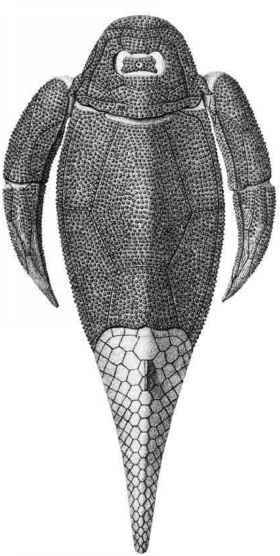 Although Charles Lapworth was able to demonstrate and justify the separation and reallocation of much of Murchison's enlarged Lower Silurian as a major division in its own right in 1879, it was several decades before this new tripartite division of the Lower Palaeozoic was generally accepted. Lapworth had named his new division the Ordovician System, after another of the Welsh tribes of Roman Britain, the Ordovices. He effected his compromise by taking the lower part of the Silurian and upper part of the Cambrian to form a new grouping. Charles Lapworth, 1842-1920, Scottish schoolmaster (1864-75) turned professor of geology in Mason College, later Birmingham University (1881-1914), who defined the Ordovician System of strata. President of the Geological Society of London (1902). Lapworth claimed that the successions of predominantly seabed strata that had been called, from oldest to youngest, Arenig, Llandeilo and Bala could be distinguished as a system in their own right, with a distinct fossil fauna and distinct rock types because they also contain a distinctive suite of volcanic rocks. A lot of lavas and ashes are interbedded with the marine deposits, which are mostly sandstones and slaty shales but also contain the occasional limestones. Furthermore, he claimed that the new system could be distinguished in both North and South Wales, the Lake District and the Southern Uplands of Scotland, but it had been the latter that had provided him with the means to make the distinction. The volcanic processes that generated many of the distinctive volcanic rocks that are interlayered with the Ordovician marine sediments of Wales also produced other deposits of great historical and economic importance. Parys Mountain in Anglesey was for a time in the late eighteenth century (1768-88) the world's greatest producer of copper, with some 3000-5000 tonnes of metal being smelted each year. The mine was worked from Roman times or perhaps earlier, but was probably more or less defunct during the Mediaeval period. The sulphide ores occur within Ordovician volcanic rocks, which still contain significant reserves of zinc, copper, lead, silver and gold. Similar sulphide ores are also found in Ordovician volcanic rocks and strata in Snowdonia. Famously, gold associated with Ordovician-age intrusive volcanic-related rocks has been recovered from the Harlech region in North Wales, but the host strata here are Cambrian in age. Maximum production was at the beginning of the twentieth century, when some 1.5 tonnes of gold metal were recovered from 150,000 tonnes of ore over the decade 1900-9. When Lapworth had been a schoolmaster in the Southern Uplands, he had spent a great deal of time and effort trying to unravel the complex structure and subdivision of the strata of this borderland region between Scotland and England, which the Geological Survey regarded as entirely Silurian. The rolling hills have many scattered outcrops of rock and are dissected with hundreds of streams (or burns as they are called here), which cut down through the thin soils to provide narrow streambed exposures of the rocks. Many of the rocks are very similar kinds of deposits with repeated alternations of sandstones and shales, but they do contain quite a lot of fossils, especially those belonging to a strange group of extinct marine colonial organisms called graptolites. Lapworth eventually realised that their fossils provided a 'key' that would help unlock the puzzling sequence of Southern Uplands strata that have been folded like a concertina and then faulted. Graptolite fossils tend to be preserved as black carbonaceous lines on the rock surface, just a few millimetres wide but elongate, from 5-1000 mm long, looking like lines drawn with a pencil. Indeed, the name is derived from the Greek graphos and lithos, meaning 'writing on the rock', and was first given to the group by Linnaeus. However, we now know that the specimen he originally described and figured as Graptolithus is in fact not a fossil in the modern sense but an inorganic dendritic mineral growth. Nevertheless, it does also resemble some graptolites and moss-animals (bryozoans), so because of historical precedent and usage the name graptolite has been retained. 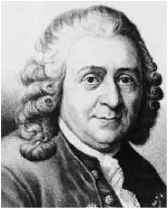 Carolus Linneaus, 1707-78, Swedish physician and professor of medicine and botany in Lund (from 1741), trained in Sweden and Holland, whose systematic attempt to catalogue all known life is taken as the beginning of scientific taxonomy and classification using a Latin binomial system, i.e. species and genus. His first edition of Systema Naturae in 1735 contained plants and by 1758 the tenth edition included some 11,900 plants and animals. Gertrude Lillian Elles, 1872-1960, palaeontologist in Cambridge who (with Lapworth and E. M. R. Wood) made a particular study of fossil graptolites and their use in stratigraphy. individual. The tubular skeleton housing the colony is a tough organic protein exuded by the zooids. Although they look like some curious kind of plant, they were in fact invertebrate animals and are related to an obscure living group of hemichordate marine creatures called pterobranchs. Lapworth realised that subtle differences could be distinguished between assemblages of graptolites found at different levels within the thick sequence of strata. He taught himself to recognise the various graptolite species and tried to work out their evolutionary relationships. From this he was able to subdivide and correlate Lower Palaeozoic strata with a refinement and confidence that had previously been unobtainable. Detailed biozonation of this kind had been developed first by the German palaeontologist Oppel (1856-1858) within younger strata of the Jurassic using ammonites. 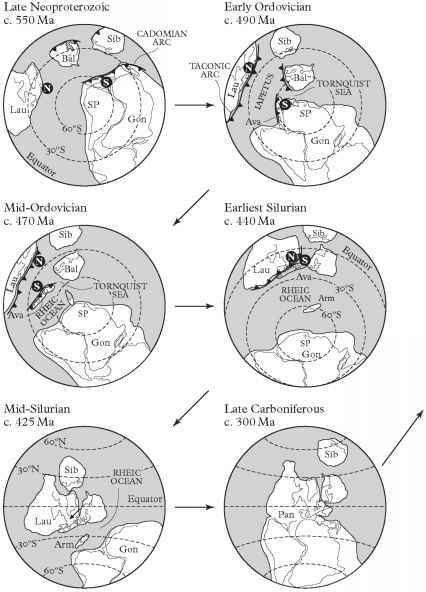 Lapworth's breakthrough in the development of biozonation not only helped him discern the Ordovician as a separate system, but also marked the beginning of the modern phase of subdivision of Lower Palaeozoic strata in general. Lapworth became Professor of Geology in Mason College, Birmingham (later the University of Birmingham) and encouraged the further investigation of graptolites. By the end of the nineteenth century two of his students, Gertrude Elles and Ethel Wood, were working their way through the Ordovician and Silurian strata of Wales by pony and trap and on foot, in their long dresses, hammer and chisel in hand, recovering tens of thousands of these fossils and carefully mapping which strata they occurred in. Ethel Mary Reader Wood, 1871-1945 (Dame Ethel Shakespear), Cambridge-trained palaeontologist who collaborated with Elles and assisted Lapworth with his study of graptolites (1896-1906), created Dame for her public services. The Misses Elles and Wood, later Doctors Elles and Wood, identified many new species and developed a whole new biozonal scheme based on the vertical (evolutionary and stratigraphical) distribution of graptolite species within the succession of strata. Some graptolite species are relatively short lived, but because of the way they lived as plankton in the ancient oceans they are also widely distributed. Consequently, the discovery in the Southern Uplands of Scotland and in Wales of certain key or characteristic species for a particular Silurian zone shows that the strata of the two separate localities were originally laid down at the same 'time', geologically speaking. Although the Southern Uplands of Scotland and Wales are today 300 km (220 miles) or so apart, they were much further apart in Ordovician times (see below). Gertrude Elles went on to Cambridge University and during the course of a long career there continued to work on graptolites, producing what was for many years the standard work of description, illustration and biozonation of lower Palaeozoic graptolites, which was used as a reference throughout the world. Graptolite biozonation has continued to be an extremely valuable means of identifying and relatively dating lower Palaeozoic marine strata. New refinements have produced a modern biozonation in which each biozone represents a million or so years. The Silurian now has some 40 graptolite biozones and is known to have lasted for 27 million years, thus on average each biozone has a time equivalent of less than 1 million years, which is an astonishing level of refinement. Sir Archibald Geikie 1835-1924, Scottish professor of geology at Edinburgh (1871-81), director of the Geological Survey of Great Britain (from 1882), president of the Geological Society of London (1890) and the Royal Society (1908-13), knighted 1891.
confined to the Tremadoc Group, Lingula Flags and Harlech Group in North Wales, while the Lower Silurian extended down from the Caradoc or Bala Group through the Llandeilo Group to include the Arenig Group with no recognition of the Ordovician. Throughout the twentieth century, the establishment and international acceptance of the Ordovician and reinstatement of the Cambrian also led to a reappraisal and posthumous increase in Sedgwick's status as an important if still somewhat tragic figure in the history of geology. The Woodwardian 'fossil' collection and other fossils subsequently amassed by Sedgwick and his successors were rehoused in a purpose-built university museum in Cambridge called the Sedgwick Museum, which was opened in 1904 by King Edward VII. The international status of the museum helped further Sedgwick's status, while Murchison's eminence and importance waned considerably. Throughout the twentieth century historians of science and the 'folklore' tradition of the increasingly egalitarian and professionalised 'middle-class' enterprise of geology turned against Murchison. He was and still is largely portrayed as a snobbish and pompous empire builder who unfairly did Sedgwick 'down' and was overly concerned with status and collecting titles, honorary degrees and medals. While much of this may be true, Murchison's achievements were very considerable and he was evidently capable of inspiring cooperative efforts, both with Sedgwick and others such as von Keyserling and Verneuil. I doubt that any other British geologists could have organised and carried out his 'Permian' campaign in Russia. His personality and driving force might have been overbearing at times, but it is also possible that to begin with he inspired Sedgwick to achievements such as their work in Devon and in the Alps that Sedgwick might not have achieved on his own. The old sequence of Transition strata that Murchison and Sedgwick subdivided, with a little help from Lapworth, into Cambrian, Ordovician, Silurian and Devonian is now known to record an extraordinary episode in the geological story of the British Isles. The story is so unlikely that if it were not for the acceptance today of the mechanisms and processes of plate tectonics, no serious scientist would countenance it. The short version tells how southern Britain in Cambrian times was originally part of North Africa and the supercontinent of Gondwana. From the northern edge of Africa, a fragment called Avalonia (which includes southern Britain and southern Ireland) broke away in late Cambrian times and moved north. In doing so it 'closed' (subducted) the ocean in front of it (called Iapetus) and opened another (the Rheic Ocean) behind it, before colliding with North America (known geologically as Laurentia), which also lay in the southern hemisphere. The subduction of the Iapetus ocean floor rocks generated intensive volcanicity on Iapetus, which is recorded in the Ordovician lavas and ashes of the Lake District and North Wales. These volcanoes rose above sea level, forming landscapes on which terrestrial sediments were at times laid down. Some shallow-water lake sediments in the Lake District preserve one of the earliest indications of life moving onto land. Some sandstones interlayered with ashes have been found to preserve the tracks of a freshwater, millipede-like arthropod, although the remains of the fossil itself have not been found. The transition from a supportive watery environment into the light gas we know as air was a very difficult one that required several preadaptions, such as protection from dessication and the ability to obtain oxygen from air, which is a dry gas. Avalonia emerged as a landmass and the offshore sedimentary environments became shallower and shallower. Near-shore sediments in the Welsh Borderlands record another important development in the history of life. Remains of the first land plants were washed out to sea and became incorporated in shallow offshore sediments now preserved as muddy siltstones of Silurian age in Herefordshire. Tiny (i —2 cm) plant fragments have been found that belong to the first plants that could grow upright on land, using sunlight to photosynthsise and build their tissues. Called vascular plants, their simple stems can grow against gravity and are held upright by strengthened cells. There are no leaves, but the stems are forked and terminated by capsules that hold the reproductive spores. Reproduction was still very primitive and it was necessary for the plants to grow in watery environments so that the gametes could be exchanged via the water. So the Silurian period saw the beginnings of the greening of the land. By the end of Silurian times, Avalonia, and coincidentally another plate fragment called Baltica (Scandinavia and northwestern Russia), collided with the northeastern margin of North America. For the first time, southern Britain was brought into contact with northern Britain, which had been part of the northeastern margin of North America. Scotland and northwestern Ireland are essentially part of the North American continent and only by the accident of geological history have become 'welded' tectonically onto southern Britain. However, the formation of what we now recognise as the British Isles had to await another 340 million years. Christian Pander's biological expertise and access to well preserved fossils allowed him to produce beautiful and accurate illustrations of the strange bony jawless fish of the Old Red Sandstone in 1857. Old Red Sandstone was deposited in large lakes and rivers draining from the northwest towards the southeast and the Rheic Ocean. These freshwaters were occupied by rapidly evolving and very diverse groups of fish, along with the arthropods, molluscs and algae on which they fed. The most abundant fish were strange, jawless creatures largely covered (except for the tail region) in thick, leathery plates of spongey bone. In some Old Red Sandstone strata their fossils are common enough and they evolved rapidly enough to be of use as biozonal indicators, in much the same way as graptolites. Seabed deposits of Devonian age are preserved in southwest England and, as we have seen, it was their contemporaneity with the continental Old Red Sandstone that caused so much confusion and difficulty over their relative age.